On every parent’s wish list is the somewhat abandoned hope that all of the LEGO bricks in the house would somehow manage to stay corralled in one place, in any kind of order — or at least off the floor to limit the peril of piercing a foot on a rogue block (there are even special slippers designed to protect feet from such an occurrence!). For these reasons and more, this DIY project: How to make a LEGO build and storage table really speaks to us. The all-in-one workspace acts as a LEGO storage unit and as a base for building. Simply slide the sides apart to reveal your kid’s LEGO collection, and he/she can construct directly on the LEGO panels that comprise the tabletop. Visit I Like to Make Stuff for the entire tutorial. On every parent's wish list is the somewhat abandoned hope that all of the LEGO bricks in the house would somehow manage to stay corralled in one place, in any kind of order -- or at least off the floor to limit the peril of piercing a foot on a rogue block (there are even special slippers designed to protect feet from such an occurrence!). 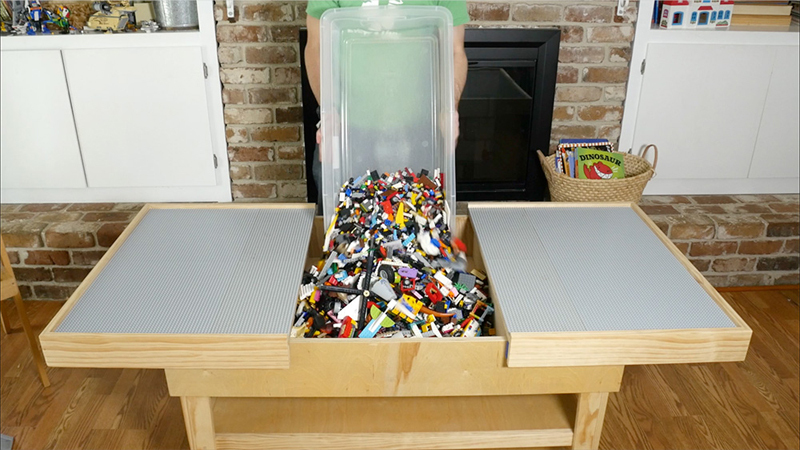 For these reasons and more, this DIY project: How to make a LEGO build and storage table really speaks to us. The all-in-one workspace acts as a LEGO storage unit and as a base for building. Simply slide the sides apart to reveal your kid's LEGO collection, and he/she can construct directly on the LEGO panels that comprise the tabletop. Visit I Like to Make Stuff for the entire tutorial.